it’s finally summer time which means my freezer is full of yummy, cold treats like popsicles, otter pops, and ice cream treats – i’ve got to have a stash on hand for when the neighborhood kids stop by! the best thing in my freezer, though, is this oreo chocolate candy-filled ice cream cake. 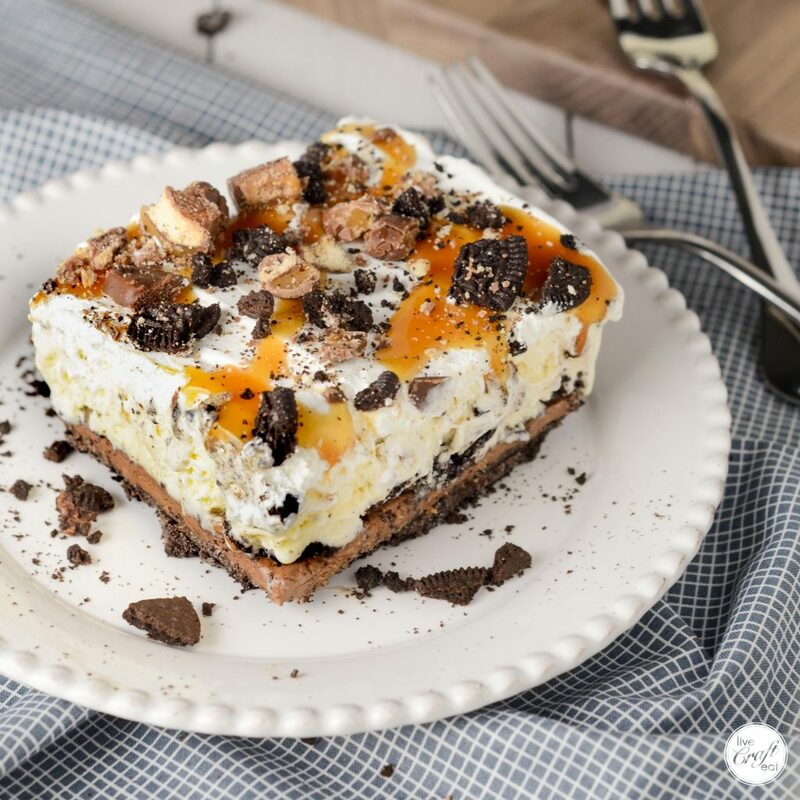 it’s got a no-bake oreo crust, a fudgy chocolate layer followed by vanilla ice cream + chopped up candy bars, cool whip, a caramel drizzle, and then sprinkled with more chopped candy bars. i mean…really. what is not to love about this cake! so first things first. the oreo crust. 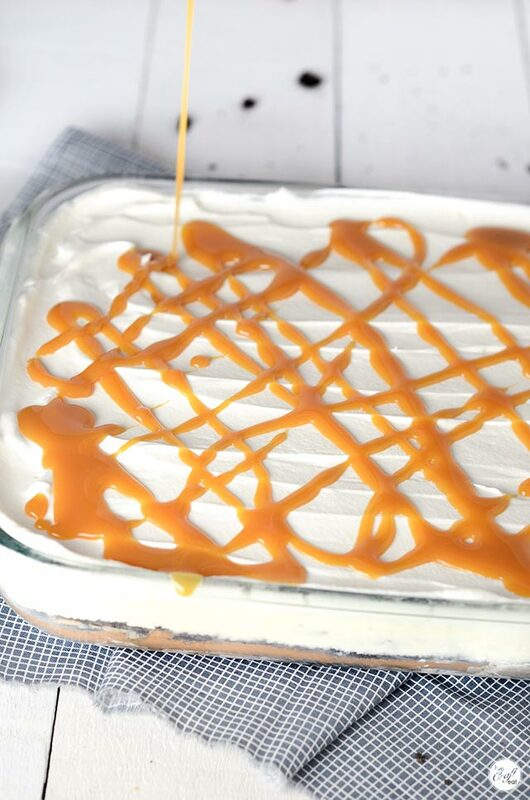 it’s no bake, which means your kitchen will stay cool in the summer heat. 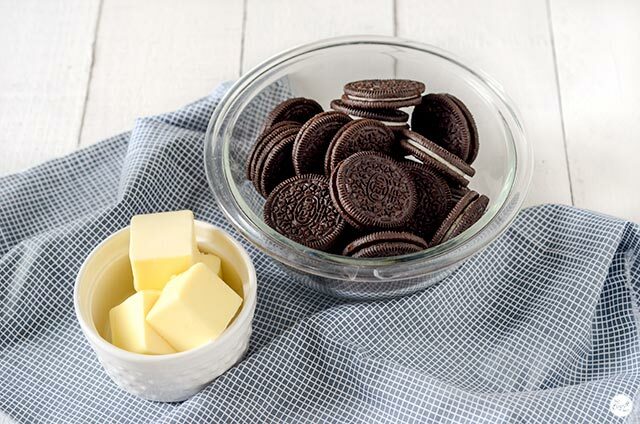 it also only has 2 ingredients :: butter and oreos. i don’t know what could beat that combination! it’s so easy to make. 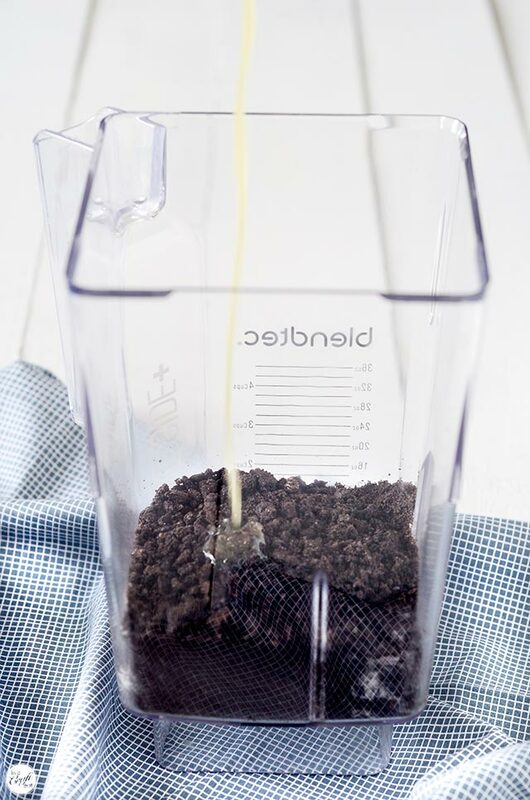 just throw the oreos into a blender or food processor and pulse until you get fine crumbs. add in the melted butter and pulse some more until it starts to come together and get slightly sticky. 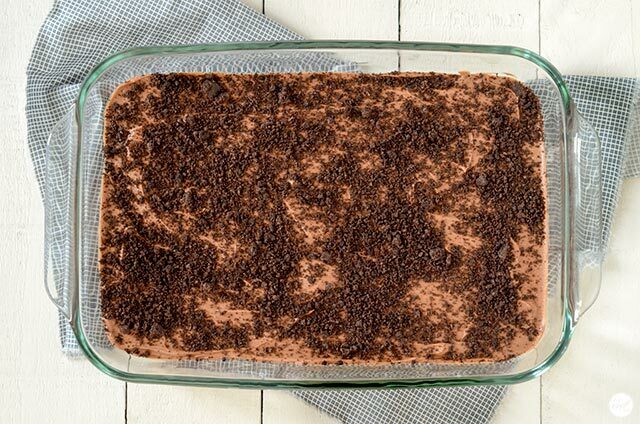 now all you need to do is press the oreo crumbs into a pie plate, or in this case, a 9″x13″ pan. 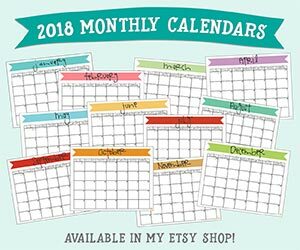 just use your fingers or the bottom of something metal or glass (like a measuring cup) to get it nice and flat and smooth and even. next, is the hot fudge sauce! except it won’t be hot. you can buy store bought stuff, or you can use this recipe for easy homemade hot fudge sauce (only 5 ingredients!) here. [just don’t mind the pictures…i’ll do retakes soon!!] sometimes i use the cooled chocolate sauce as is because it’s nice and thick and fudgy. other times (like this one) i mixed 2 cups of it with 2 cups of powdered sugar to make it more like an icing consistency. you can do whatever you want! once you have your chocolate sauce/hot fudge sauce spread out in a layer, sprinkle some extra oreo crumbs on top. just because. it reminds me of the dairy queen ice cream cakes i used to looooove as a kid. then put it in the freezer for 20 minutes or so. next, grab some vanilla ice cream. you could use chocolate instead and that would be delicious. 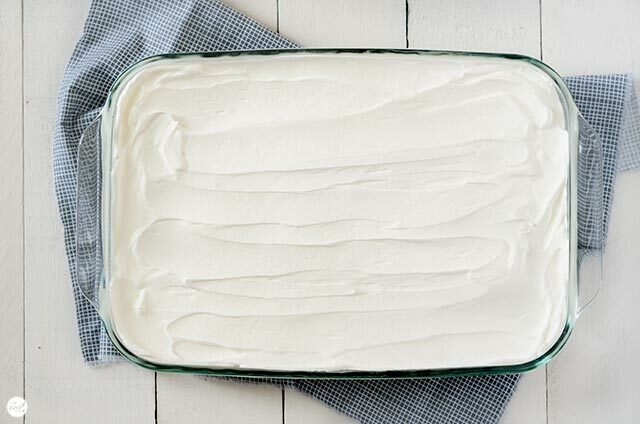 you can also use as much or as little as you’d like, but since this is ice cream cake, we’ll go for a full 1.5 quart (the standard breyers size) carton. you want to let it soften on the counter for about 15-20 minutes, until it’s easy to stir, but not so melted that it’s a mess. cut up your favorite candy bars into little pieces (don’t forget to add some more oreo cookies in, too!) and add them to the ice cream. stir until the candy pieces are well distributed. 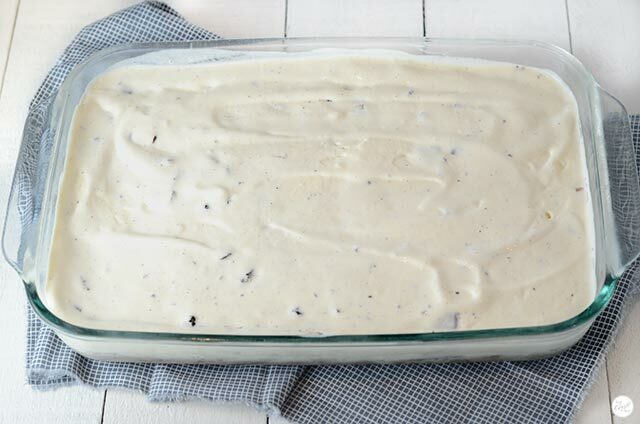 now you just need to pour the ice cream into your cake pan and spread it into an even layer. put it in your freezer for about 20 minutes or until it’s completely frozen once again. then add some cool whip. because, why not?! and either put it back in the freezer, or serve it right away! this cake is the perfect thing for those hot, lazy, summer days and for get togethers with family and friends. 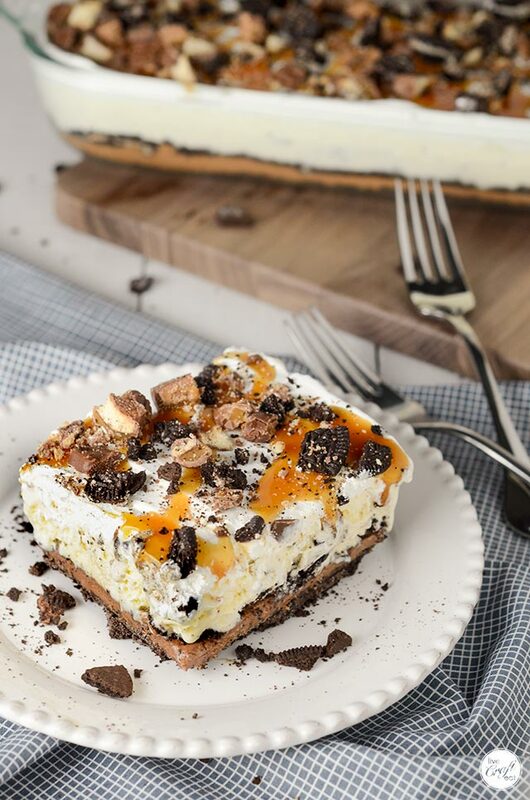 customize it however you’d like – just use the oreo cookie base + your favorite hot fudge sauce + your favorite ice cream and mix-ins + cool whip + more mix-ins! i really don’t see how you could go wrong with this equation! happy summer, and happy ice cream cake! 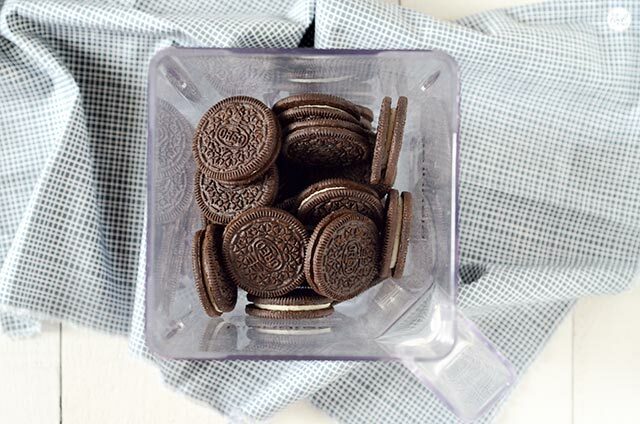 pulse oreo cookies in blender or food processor until you have coarse crumbs. add melted butter and pulse until the cookie crumbs begin to come together. 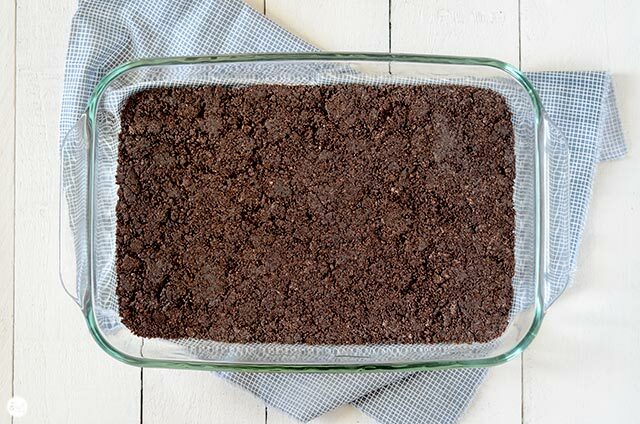 press oreo crumbs into a 9x13 pan. 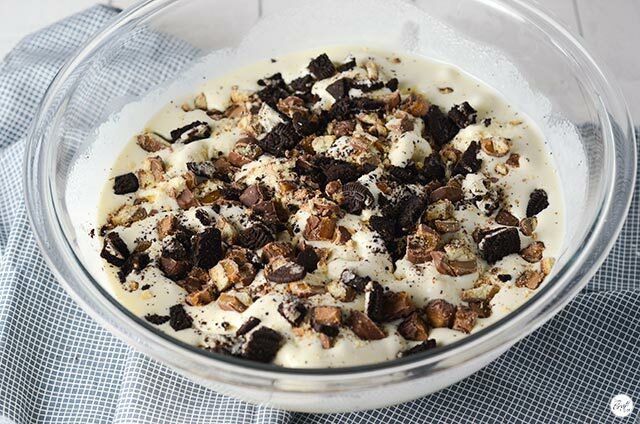 add chopped candy bars to the softened ice cream and set aside while you make the layers. more cookie crumbs. freeze 20 minutes. 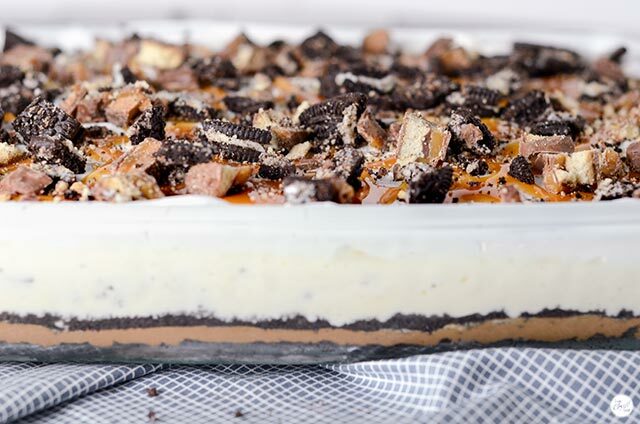 ice cream + chopped candy bars layer. freeze 20 minutes. add more chopped candy bars/oreo cookies. serve immediately. store in freezer. if completely frozen when serving, let sit for a few minutes to soften slightly. Easy AND good! Just perfect!